This award is available to all Radio Amateurs who submit evidence of having worked 100 approved current entities using the PHONE mode. QSO's made on 'nets' are acceptable as long as the basic QSO information [callsign & signal report] is exchanged and confirmed unassisted. 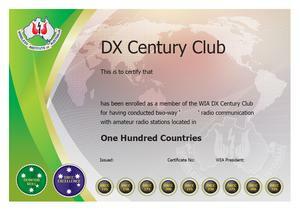 The basic DXCC award is available for confirming 100 or more approved DXCC entities. Contact & Confirm a minimum of 100 DXCC entities on any Phone mode. Endorsements are issued at increments of 25 entities. (Purchased separately) (125, 150, 175, 200, 225, 250, 275, 300, 325, 330, 335). working and confirming 331 entities. 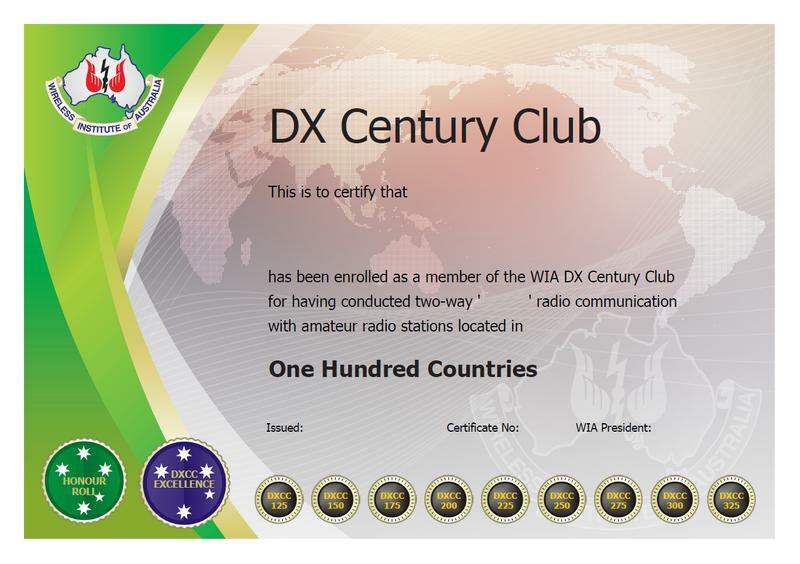 WIA "DXCC Excellence" achievement is available for working and confirming all current 340 entities.